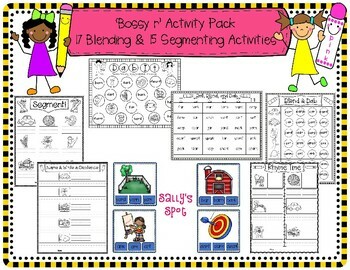 There are 17 blending and 15 segmenting activities in this pack which focuses on ‘ar’. 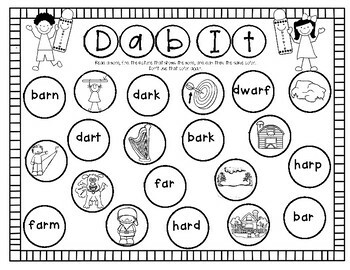 Dab It – A Blending Activity (Literacy Station or Small Group) There are 4 different sheets. The children will need a ‘Dab It’ sheet and 10 different color paint dabbers. They will blend a word and find the picture that illustrates the word. They will dab the picture and the word the same color. They will use a different color paint dabber to dab each pair. Crayons can be used if you don’t have paint dabbers. Roll, Blend, & Dab – A Blending Game (Literacy Station or Small Group) Two to four children play this game. The children will use 1 game sheet, 1 dot or number cube/dice, & 1 different color paint dabber per child. The children will take turns rolling the dice. The child will pick any word that hasn’t been covered in the row of the number they rolled. He/she will blend the word and dab it if they can read it. If a child rolls a 6, they read a word under 6, and then take another turn. If all the words are covered in the row rolled, the child misses his/her turn. The child with the most words dabbed after all are covered, is the winner. Blend & Dab – A Blending Activity (Literacy Station, Small Group, or Whole Group) There are 5 different sheets. Each child needs a ‘Blend & Dab’ sheet and a paint dabber. The children dab the word in the row that names the picture. Blend & Clip Cards – A Blending Activity (Literacy Station or Small Group) There are 40 cards. Print the 40 cards on cardstock and laminate them. You will need clothespins or paper clips. The children will blend the 3 words on the card and clip the word that names the picture on the card. Segment, Name Me, Spell Me, & Spell – 4 Different Segmenting Sheets (Literacy Station, Small Group, or Whole Group) The children will segment each word to spell it. Name & Write a Sentence – A Segmenting Activity (Literacy Station, Small Group, or Whole Group) There are 4 different sheets. There are 4 different sheets that go with the segmenting sheets above or they can be used as a different activity. Some children will not be ready to write sentences yet. These sheets are to be used for children that are ready. They can do this sheet instead of the sheets above in which they spell/segment the 9 words. This sheet uses 5 of the nine words on the segmenting sheet from above. The child spells the word on the top line and then uses it in a sentence. This can be used for differentiation. 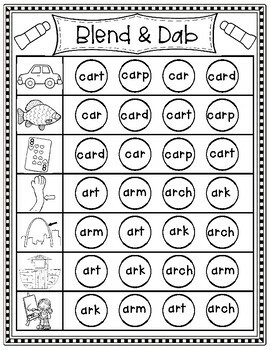 Spell Me – A Segmenting Activity (Literacy Station, Small Group, or Whole Group) There are 3 different sheets. The children will color, cut out the pictures, and glue them in the boxes. They will then segment the words to spell each picture underneath. The ‘Blend & Match’ sheet below can be used with children that aren’t ready to segment. Set 4 – chart, smart, arch, shark, charm, spark, sharp, star, target Blend & Match – A Blending Activity (Literacy Station, Small Group, or Whole Group) There are 4 different sheets. The children color and cut out the pictures. They then blend each word on the sheet, find the picture that illustrates the word and glue it in the box. Use the same pictures that are used for the ‘Spell Me’ activity. 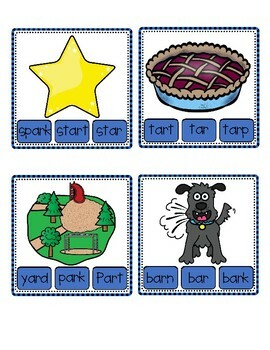 Rhyme Time – A Rhyme & Segmenting Activity (Literacy Station, Small Group, or Whole Group) There are 2 different sheets. The children color the pictures. They cut out the 6 pictures and glue them next to the picture on the sheet that rhymes with them. They then segment each word to spell it under all the pictures. Draw Me & Blend & Draw (Literacy Station, Small Group, or Whole Group) There are 2 sheets. The children will blend the word in the arrow and draw a picture to illustrate the word in the box the arrow is pointing to. Segment, Write, and Read (Literacy Station, Small Group, or Whole Group) There is 1 sheet. The children will look at the 2 pictures under the lines in each sentence, segment, and write the words on the lines. They will then read the sentence. Sheet 1 (barn/farm) I went in the barn on the farm. (star/dark) I saw a star in the dark sky. (jar/cart) Put the jar in the cart. (bark/park) The dog will park at the park. (scar/arm) Bart has a scar on his arm.